Our decorative wreaths make a wonderful addition to your home regardless of the season. Whether you hang them as a front door wreath or put them up around your house, we’re sure you’ll love the unique look it brings your home. Burlap is also the perfect material for a memorable wedding wreath. Throw in some bright ribbon or fresh flowers and you’ve got the perfect decoration for any spring event. Burlap fabric, also known as Hessian or Jute, is a strong durable fabric usually made from skin of the jute plant (wiki). Prized for it’s durability, burlap has historically been used in industrial applications. However, recently burlap decor has made a comeback due to its elegant but rustic look. Our wreaths are constructed using six inch burlap ribbon attached to a sturdy metal frame. Each wreath comes in twelve inch and eighteen inch varieties. 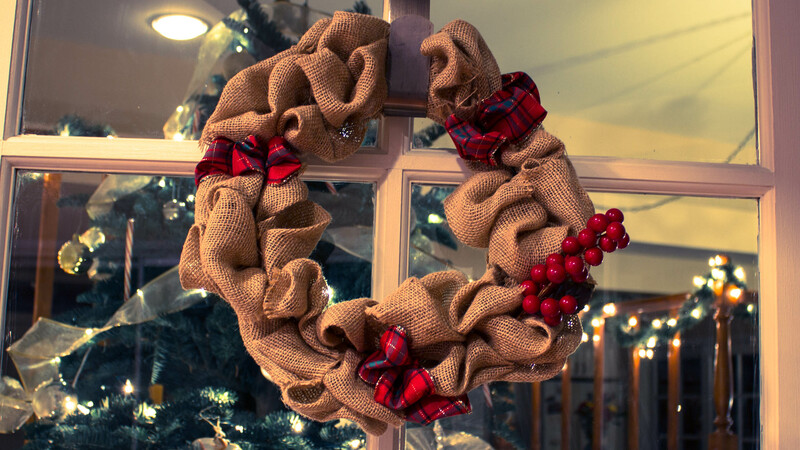 Want to make your own burlap wreath instead? Order one of our wreath kits and we’ll ship everything you need right to your door. We’ve got easy to follow instructions that will show you how to make a burlap wreath in no time. See how easy it is by checking out one of our burlap wreath tutorials and you’ll learn how to make a wreath in less then 10 minutes; no glue required! Then head over to our store to shop our selection of burlap wreath supplies and you’ll be making one of your very own wreaths in no time. Copyright 2015 © Jelled Media, LLC.